PANAMA CITY, Oct 22 2014 (IPS) - For indigenous people in Panama, the rainforest where they live is not only their habitat but also their spiritual home, and their link to nature and their ancestors. The forest holds part of their essence and their identity. “Forests are valuable to us because they bring us benefits, but not just oxygen,” Emberá chief Cándido Mezúa, the president of the National Coordinator of Indigenous Peoples of Panama (COONAPIP), told Tierramérica. “It is organic matter, minerals in the forest floor, forms of life related to the customs of indigenous peoples,” added Mezúa, the seniormost chief of one of Panama’s seven native communities, who live in five collectively-owned indigenous territories or “comarcas”. In this tropical Central American country, indigenous people manage the forests in their territories through community forestry companies (EFCs). But Mezúa complained about the difficulties in setting up the EFCs, which ends up hurting the forests and the welfare of their guardians, the country’s indigenous communities. Of Panama’s 3.8 million people, 417,000 are indigenous, and they live on 16,634 sq km – 20 percent of the national territory. According to a map published in April by the National Environmental Authority (ANAM), drawn up with the support of United Nations agencies, 62 percent of the national territory – 46,800 sq km – is covered in forest. And this Central American country has 104 protected areas that cover 35 percent of the national territory of 75,517 sq km. But each year 200 sq km of forests are lost, warns ANAM. The EFCs “are an effort that has not been well-developed. They merely extract wood; the value chain has not been developed, and the added value ends up outside the comarca,” said Mezúa, the high chief of the Emberá-Wounaan comarca on the border with Colombia, where his ethnic group also lives, as well as in Ecuador. The indigenous leader said the EFCs help keep the forests standing in the long term, with rotation systems based on the value of the different kinds of wood in the management areas. “But it is the big companies that reap the benefits. The comarcas do not receive credit and can’t put their land up as collateral; they depend on development aid,” he complained. Only five EFCs are currently operating, whose main activity is processing wood. In 2010, two indigenous comarcas signed a 10-year trade agreement with the Panamanian company Green Life Investment to supply it with raw materials. But they only extract 2,755 cubic metres a year of wood. The average yield in the comarcas is 25 cubic metres of wood per sq km and a total of around 8,000 cubic metres of wood are extracted annually in the indigenous comarcas, bringing in some 275,000 dollars in revenue. In five years, the plan is to have 2,000 sq km of managed forests, the indigenous leader explained. The government’s Programme for Indigenous Business Development (PRODEI) has provided these projects with just over 900,000 dollars. But only a small proportion of forests in indigenous territories is managed. Of the 9,944 forest permits issued by ANAM in 2013, only 732 went to the comarcas. In Mezúa’s view, the hope for indigenous people is that the EFCs will be bolstered by the U.N. climate change mitigation action plan, Reducing Emissions from Deforestation and Forest Degradation (REDD+). REDD+ Panama is currently preparing the country for the 2014-2017 period and designing the platform for making the initiative public, the grievance and redress mechanism, the review of the governance structures, and the first steps for the operational phase, which should start in June 2015. 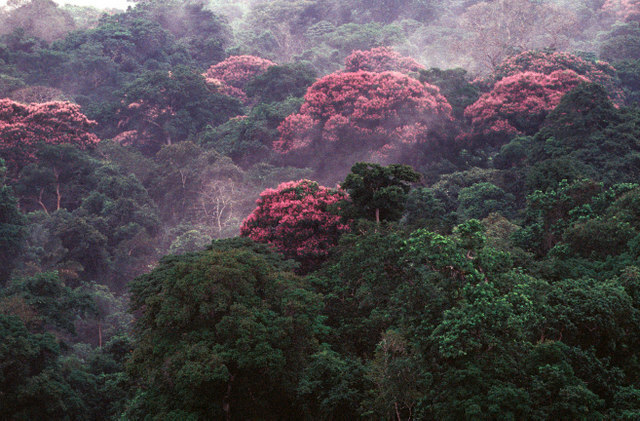 UN-REDD was launched in 2007 and has 56 developing country partners. Twenty-one of them are drawing up national plans, for which they received a combined total of 67.8 million dollars. The Latin American countries included in this group are Argentina, Bolivia, Ecuador, Panama and Paraguay. Because forests trap carbon from the atmosphere and store it in tree trunks and the soil, it is essential to curb deforestation in order to reduce the release of carbon. In addition, trees play a key role in the water cycle through evaporation and precipitation. 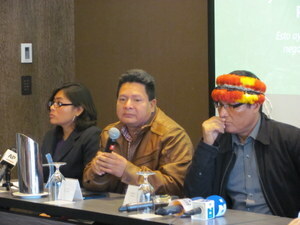 Panama’s indigenous people believe that because of the position that trees occupy in their worldview, they are in a unique position to participate in REDD+, which incorporates elements like conservation, improvement of carbon storage and the sustainable management of forests. But in February 2013, their representatives withdrew from the pilot programme, arguing that it failed to respect their right to free, prior and informed consultation, undermined their collective right to land, and violated the U.N. Declaration of the Rights of Indigenous Peoples. They only returned in December, after the government promised to correct the problems they had protested about. In REDD+ there should be a debate on “the safeguards, the benefits, the price of carbon, regulations on carbon management, and legal guarantees in indigenous territories,” Mazúa said. “We want an indigenous territory climate fund to be established, which would make it possible for indigenous people to decide how to put a value on it from our point of view and how it translates into economic value,” the chief said. “The idea is for the money to go to the communities, but it is a question of volume and financing,” said Labbate, who is also in charge of the Poverty-Environment Initiative of the U.N. Environment Programme (UNEP) and the U.N. Development Programme. 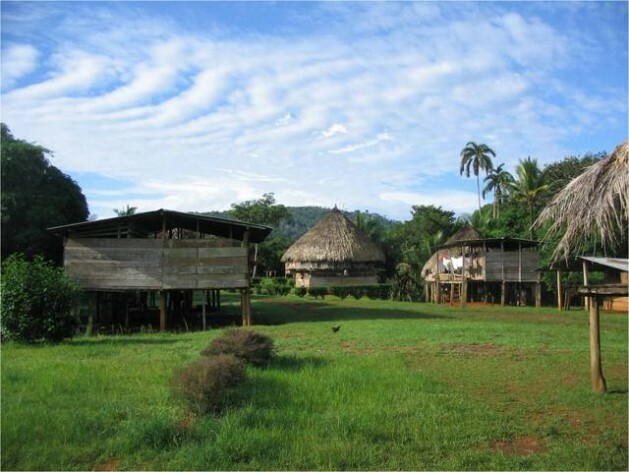 Poverty and the environment are inextricably linked to Panama’s indigenous people. According to statistics published Sept. 28 by the government and the U.N., Panama’s overall poverty rate is 27.6 percent, but between 70 and 90 percent of indigenous families are poor. Indigenous representatives are asking to be included in the distribution of the international financing that Panama will receive for preserving the country’s forests. They also argue that the compensation should not only be linked to the protection of forests and carbon capture in the indigenous comarcas, but that it should be part of an environmental policy that would make it possible for them to engage in economic activities and fight poverty. Indigenous leaders believe that their forests are the tool for reducing the inequality gap between them and the rest of Panamanian society. “But they have to support us for that to happen, REDD is just part of the aid strategy, but the most important thing is the adoption of legislation to guarantee our territorial rights in practice,” Mazúa said.